Deanna Shrodes: It's a date! 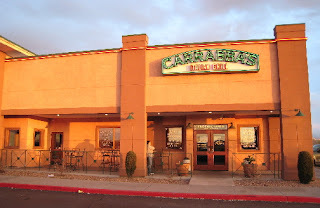 So seriously - we went to Carrabbas and had a nice leisurely dinner, just taking our time. My favorite meal there is...salad with house dressing, their homemade bread with butter (I like the butter more than the oil), Spedino DiMare, and rigatoni with tomato cream sauce on the side. There is NO MEAL in the world better than this, I assure you. By the way, Spedino DiMare is lightly breaded shrimp and scallops with a light butter/lemon sauce. You can hardly taste the lemon by the way. This is a meal I either have to save up all my extra WW points for, or seriously exercise off later. After dinner we went to the Tampa Performing Arts Center to see the Rockettes do their Christmas Spectacular. Yes, they are in town again and this is our second time of going to see them here (I've also seen them several times in New York City - I love them!). This ti me we went compliments of the Winchester's who blessed us with these tickets as a gift. Thank you, Eddie and Debbie! We got there early even with our slowly paced dinner. We got our parking space and were about an hour early so we had dessert and hot tea at Maestro's outside, which is at the Performing Arts Center - it's right outside the foyer and has little tables right there on the water where you can sit and look out. Larry got a piece of cheesecake and I got a piece of chocolate cake and we sat there for an hour before the show and just talked. 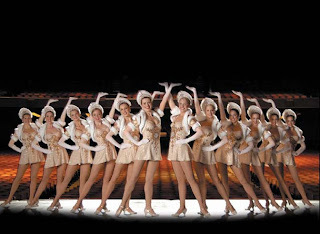 During showtime I was just mesmerized as I always am when I see the Rockettes, and sat there cozied up to my man, with my head on his shoulder as we watched the nativity and "One Solitary Life" and I get tears in my eyes every time. Well we got home and the boys immediately headed out to spend the night at a friend's, and Savanna just got out of the bath and is getting ready to lay down, watch a movie and go to sleep. So this means Larry and I have the rest of an uninterrupted night in our room, to ourselves. Truly the definition of heaven on earth. Did I mention I love Christmas break?